Did Alfred Hitchcock end his career with a whimper or a bang? Bangs & Whimpers is a series in which we take a look at the final movies of acclaimed and significant filmmakers. In this instalment we examine the final work of Alfred Hitchcock. Alfred Hitchcock prided himself throughout his career on his ability to sidestep plot, dialogue and character; three aspects of film-making that are given far too much credence in the overly verbose and plot heavy movies of contemporary Hollywood. 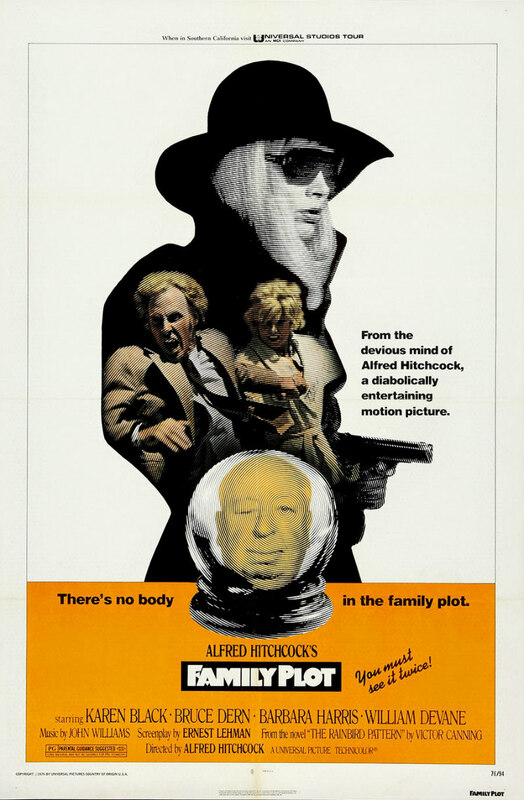 His final film, 1976's Family Plot, is brimming with all three, to its detriment, and as a result it plays more like a second rate ABC Movie of the Week than a work of the master of suspense. Barbara Harris, best known as the wannabe country star who finds fame in tragedy at the climax of Robert Altman's Nashville, plays Blanche, a fake psychic who, with boyfriend George (Bruce Dern), attempts to swindle money from an elderly client by tracking down her long lost son Arthur (William Devane), a jeweller who stays in business through kidnap and extortion, aided by his lover, Fran (Karen Black). When Arthur realises Blanche and George are about to expose him, he sets out to have them killed. Family Plot is incessantly talky by anyone's standards, let alone Hitchcock's. The opening scene alone contains arguably more exposition than can be heard the director's entire output of the previous two decades. Its script is written by Ernest Lehmann, who penned the great North by NorthWest, a shining example of visual storytelling if ever there was one. That movie had essentailly no plot, because it didn't require one, and in a memorable scene Hitchcock actually mocked plot driven films by having the one moment when a character is about to explain all drowned out by a loud airplane engine. The roar of a jumbo jet would be far preferable over the stream of poorly written dialogue offered up by Lehmann here. Naturally, there are some impressive visuals, but they occur all too rarely. The most famous shot involves a crane into a huge close up of a diamond hidden in a chandelier. Hitchcock was the primary influence on the makers of Italian thrillers in the '70s and here he gives them a nod in a great tracking shot following Fran, disguised in the sort of outfit the villain of a giallo might sport, as she picks up a ransom from a police station. Lady Gaga, of all people, referenced this scene in one of her music videos. At this stage in his life, Hitch was in troublesome physical condition. Each morning during filming of Family Plot he would receive a telephone call from the studio execs, who had him place the receiver against his chest in order to determine if his heart rate allowed him to work that day. His lack of mobility is the primary reason for this film's absence of visual inventiveness. By 1976 the idea of filming a scene in a car on a sound stage was old hat but Hitch's health prevented him from location shooting. As a result the scene where George tries to control a car with sabotaged brakes resembles something from an Ed Wood movie, the projected backgrounds moving at a ridiculously fast speed. No doubt realising it would look absurd, Hitch has Dern and Harris play the scene for laughs, which makes it even more cringeworthy. Another issue is the soundtrack by John Williams, fresh off his iconic work on Jaws. A criticism often leveled at the composer is that his music can be overbearing, and that's certainly the case here. The central harpsichord theme (again familiar to fans of Lady Gaga) is irritating and gives the film a cheap TV movie feel. At one point the camera pans to an open window to reveal a character has just made his exit. Williams wanted the score to swell when the window comes into view but Hitch wisely cut the music instead to give the image more impact. He was showing the composer that often less is more, but if you've seen any Spielberg movie from the last two decades you can't help but wonder if Williams was paying attention. 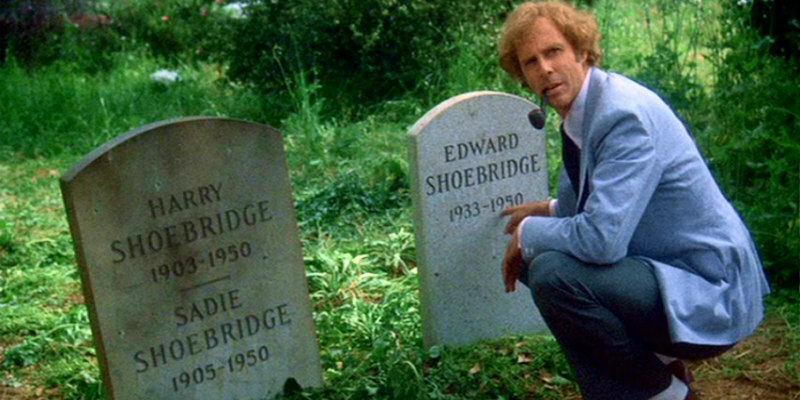 The first scene Hitch shot on this film was set in a cemetery, and the fake tombstones were embellished with the names of members of the press he had invited to witness filming. Bizarrely, this film has a cult following among Mormons, who believe the director was secretly enamoured of their faith. Some believe there are references to Mormonism throughout Hitch's films, and the cemetery used here belongs to their order. It was clear to everyone around him that this would most likely be Hitch's final film, and Dern urged him to make his famous cameo at the end of the film by walking down a set of stairs and winking at the camera in the movie's final shot. Understandably, Hitch objected as he felt he would be sealing his faith, but he does have Harris end the movie with a wink to the audience. I like to think this is Hitch's way of acknowledging the decades of joy and suspense he and his fans have shared at the expense of his characters. The verdict: Did Alfred Hitchcock go out with a whimper or a bang? If I could only take one filmmaker's filmography to a desert island, the sheer ratio of quality to quantity would make taking Hitch's oeuvre a no-brainer. But sadly, after proving with 1972's Frenzy that he could compete with the changing face of post-censorship cinema, Hitchcock went out with a whimper.